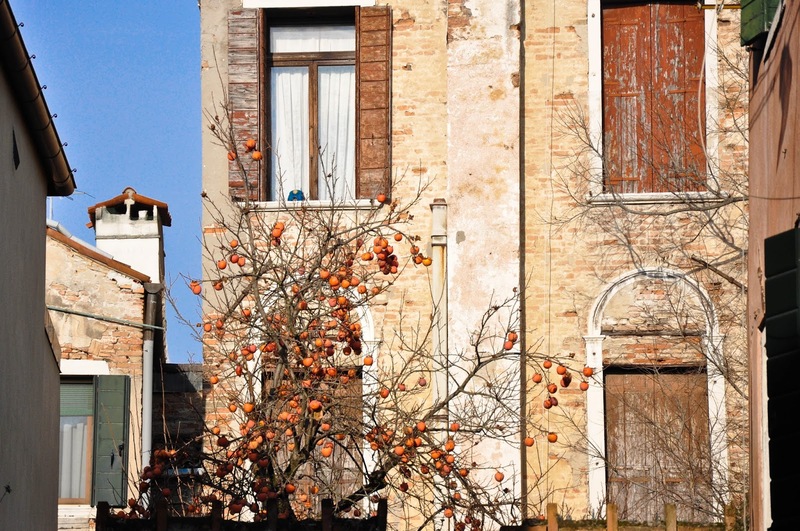 In the hazy mornings of autumnal Veneto, people, houses and streets fade out to a blurred outline. All of a sudden naked branches pierce through the mist and bright orange fruits come into sharp focus. 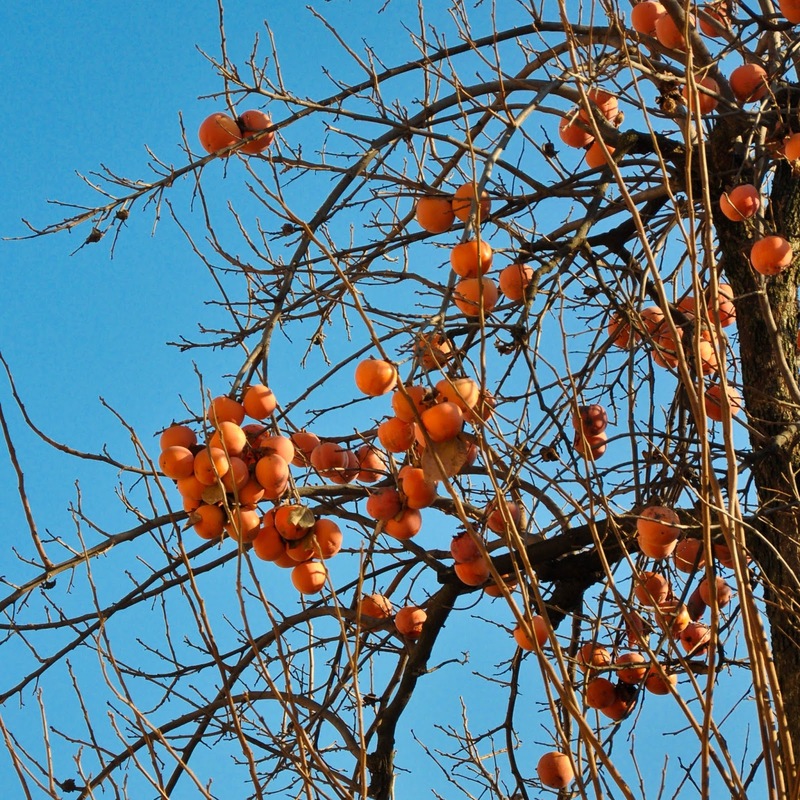 Later on during the day, when the haze has dissipated and for a few hours the sky is yet again a gorgeous Italian blue, the orange fruits, clustered together, seem brighter than the pale sun. 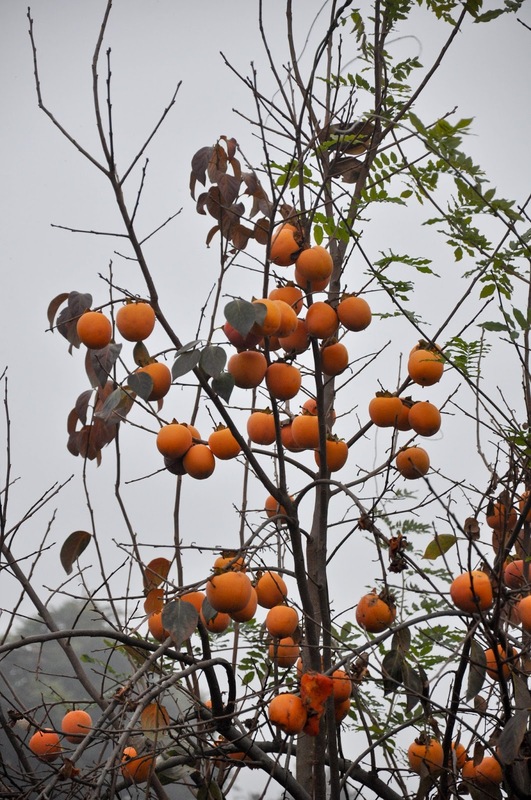 These are persimmons or sharon fruits in English. In the Venetian dialect they are known as ‘cachi mela‘. As for me, I love their name in my native Bulgarian – ‘райска ябълка‘ – which translates as ‘apple of Paradise’. 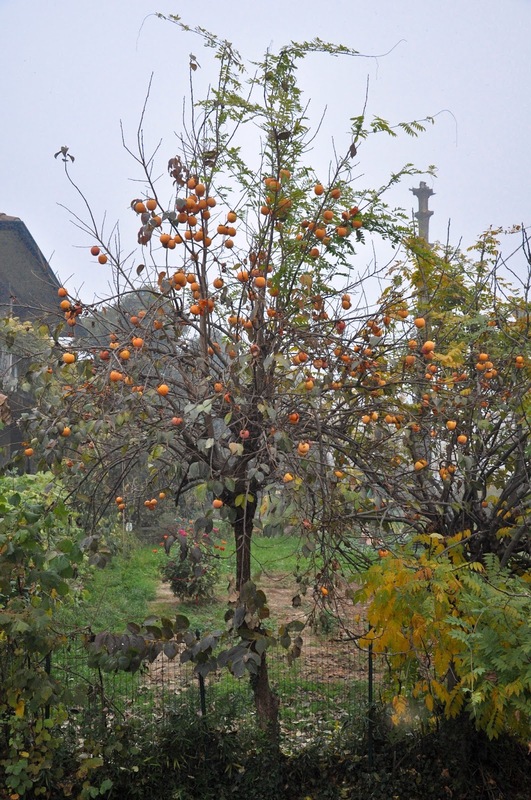 In the midst of December, when foggy days can drag on endlessly, covering Veneto with a thick grey shroud, the persimmons provide the only splash of colour, a welcome reminder that life hasn’t completely stopped. Even in the coldest of days they are ripening up on the bare branches and soon will be ready to burst into a juicy sweetness when you bite into their soft flesh. 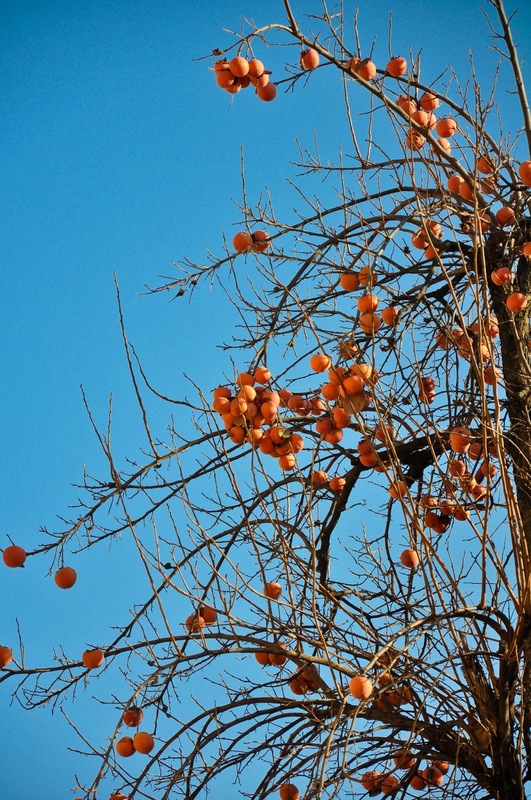 I see persimmon trees everywhere I go. As soon as autumn progressed and a thick layer of foliage covered the ground, the clusters of orange fruits started peeking above the tall fences. They wave at me from behind the forged metal gates and the brick walls of Vicenza and Venice. I spot one in every front yard in the towns and villages of Veneto. The long, brown branches extend upwards to the sun, tangled and bare after having lost all of their leaves a month or so ago. Yet, they are covered with orange fruits waiting to be picked. The persimmon is a strange fruit. It requires patience and, at the same time, it doesn’t tolerate delays. It takes ages to turn soft and juicy on the inside and then as soon as it is ready to eat, you blink and it has morphed into mush. The secret is not to forget about it on its fruit tree or in your fruit bowl and to keep checking it every now and then, by squeezing gently its thick skin. I remember, several years ago, after a long spell of living on a very restricted diet due to health reasons, I was finally given the green light to start adding fruit and other foods to my menu. So, I would have half a persimmon for dessert with a spoonful of quark on top and sprinkled with some chopped walnuts. It tasted divine! Better than any ice-cream I had ever had. 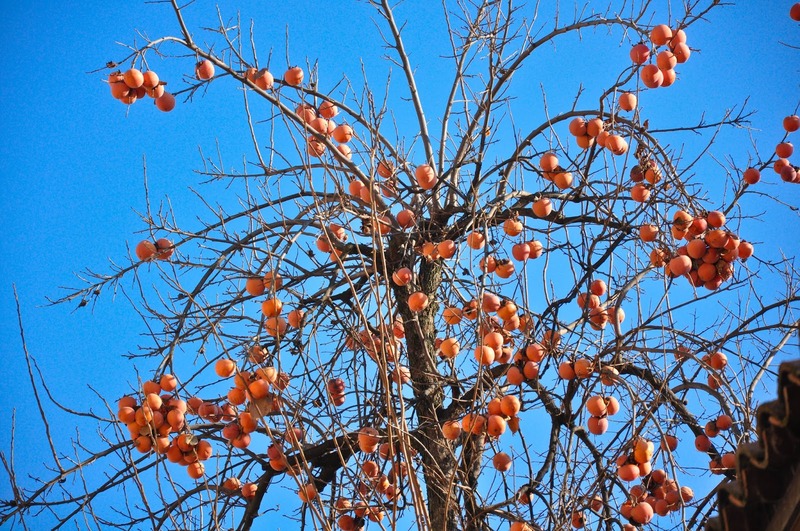 So, it was with some delight to find out that persimmons are so ubiquitous in Italy. A few weeks back I bought some. They are still in my fruit bowl at home and I check them every day. They are still a bit firm, but I expect them to be perfect right for Christmas. 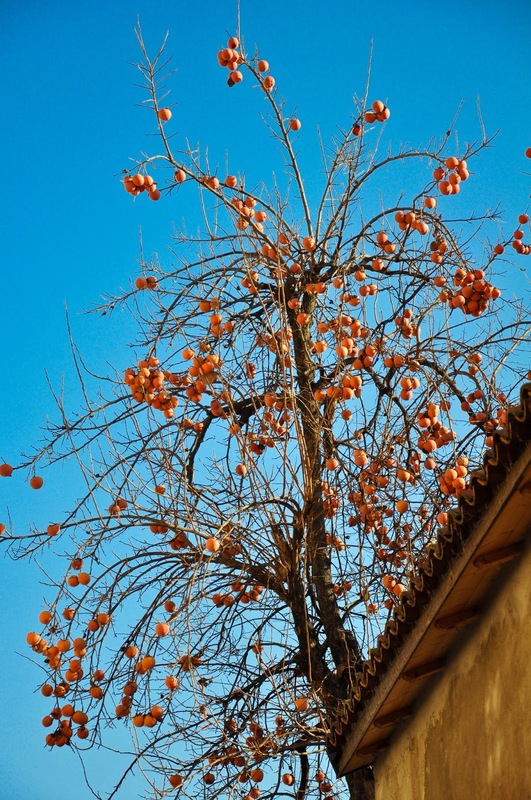 For now, I just enjoy their warm orange colour and no matter how drab the day can be, seeing a persimmon tree with its clusters of orange fruits never fails to fill me with warm sunny thoughts.